It’s taking a while, too long if you ask me. But hopefully, summer will be here soon. Now there are a lot of things to do when the sun is shining, and tanning and relaxing are probably at the top of your list. Since not everybody here in Amsterdam has a garden or balcony, you could consider the Vondelpark or Bloemendaal, but you might not want to sit there with the rest of Amsterdam smelling like weed and barbecue for the rest of the week, or like kids building sandcastles on your towel. Only 5 minutes cycling from the Amstel station is your alternative: BadBuiten. BadBuiten is inspired by Badeschiff in Berlin. 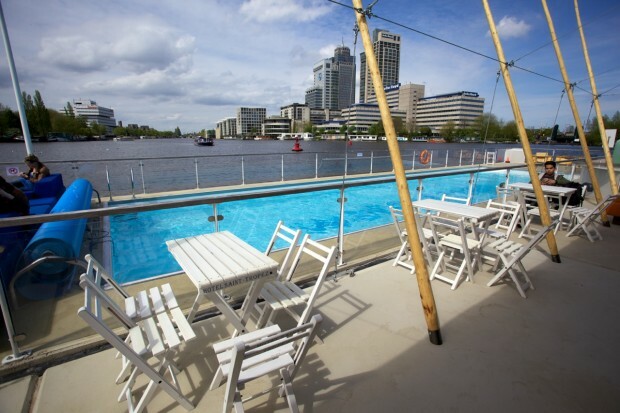 A floating bar with a pool in the Amstelriver. That means clean water with a great view over the Amstel river. Imagine yourself watching boats sail by on the Amstel, holding your cold beer, and enjoying the sun with your friends.. That’s exactly how a felt last time I went there. To me it was the perfect chill spot on a hot summer day in Amsterdam! 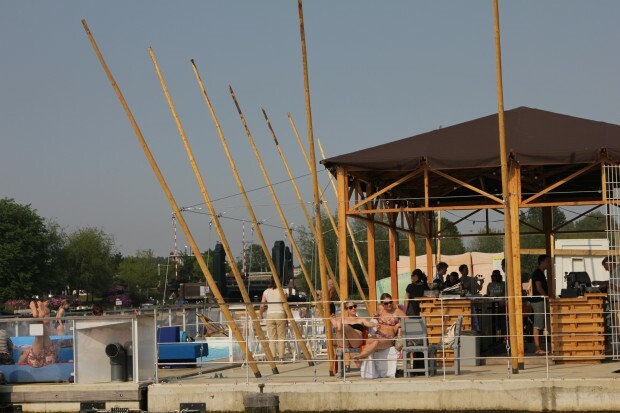 A nice fact is also that you can also arrange a private party at BadBuiten. So to hell with all the boring work trips and team buildings. Flirting with your hot colleague in a bikini is the new ‘Vrimibo’! BadBuiten is busy building a kitchen. So in a short while they will also be serving delicious evening meals in addition to the tasty tostis, which they already serve. Opening hours: Mon/Fri from 12.00, Sat/Sun from 10.00. Until sunset.